The Leopard Prototyp A is a German tier 9 medium tank. Prototype developed from 1960 through 1961 as a medium tank for the Bundeswehr, with a total of 26 prototypes manufactured. The prototypes were tested up to 1963. The vehicle was the predecessor of the Leopard medium tank. The Leopard Prototype is the pre-entry of the gameplay of the Leopard 1, featuring a much more mobile tank than its predecessor, the Indien-Panzer, with excellent accuracy, lower aiming time, a devastating gun, and very good mobility and acceleration. The downside is the low rate of fire and extremely poor armor on all its angles; artillery will be the bane of this tank as HE shells can penetrate the frontal armor with devastating effects, so remaining mobile or hidden taking out enemies from a distance are viable options. At tier, only the French Bat.-Châtillon 25 t AP has lower armor. The Leopard Prototyp A leads to the Leopard 1. Presents a fairly small target when hull-down, and can bounce the rare shot that hits the edges of the turret. The Leopard Prototyp A can fill two main roles to great effectiveness. One's first thought when looking at the Leopard is the role of a sniper, and it is an excellent sniper indeed. Boasting a very accurate gun with 0.32 dispersion and a somewhat faster muzzle velocity than it predecessor, it combines high accuracy, good alpha damage, and fairly good DPM (~2800 with Rammer and Vents) on a highly mobile, fairly well camouflaged tank. 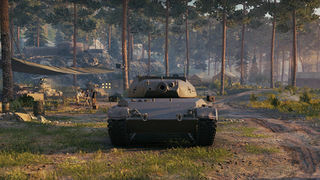 The Leopard can also quickly position itself in advantageous sniping positions, positions which also often make great use of its very high view range. All of this rolled into a single package makes it a threat from any distance, able to reliably hit weak points with its high penetration 105mm cannon, remain hidden while doing so, and re-position quickly to either get a new shot or retreat to a safe distance. In this role and for the purposes of spotting, it is highly recommended to run Coated Optics, most likely in place of Vents. Leopard Prototyp A is stealthy vehicle, but this tank has no armor, even at the turret. You have to use your speed to stay alive: a Leopard that draws half the enemy team's attention is a dead Leopard. It is great at sniping at long range and is the perfect tank for vision control on open maps. If you have to fight close to other vehicles, never go without support and an escape route. The gun's slow reload will force you to avoid any long term combat and stick to the sniping role early on. Later in the game with support you can potentially go hunting for lone enemies, but do so with caution. 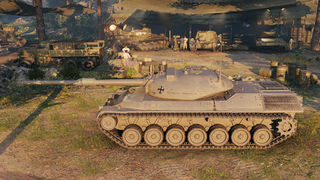 It is not uncommon for the Leopard to be one-shot by tier 10 HESH rounds. 1-on-1 brawling with other mediums is not recommended, but if one insists on doing so, cover must be made good use of. Winning a dogfight solely relies on good skill of the player and ineptitude of the other, and will at any rate, eat away a huge chunk of your health pool. Peaking is an option, but with your large size for a scout, you will be fairly easy to hit with more-or-less accurate guns and your non-existant armor will make you even more prone to damage when standing still. This is coupled because the Leopard is also a fairly attractive target due to its great gun. Losing hit points at this point in time will eventually be a waste of your great gun. Mistakes will be punished hard in this tank, but the speed and the L7A1 gun are its strengths. Do not try to take tanks head on unless you have the HP to do it - gaming your HP is vital in this tank. 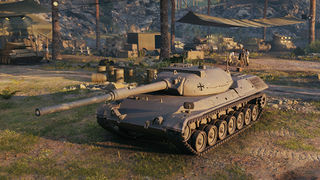 The stock grind is absolutely horrendous, as you have less armor than the Indien, less speed than the Ru 251, larger profile, and to add up to it, you will frequently face Tier 10s. Your utter lack of penetration will lead to an excessive spam of APCR rounds, and you suffer from poor alpha damage. With the stock engine, you will only cruise at around 30ish km/h. Sniping is more in your line, and you may still have a chance of bringing your team to a success. Otherwise, good luck, for you will have no problem charging back to your garage. Research the Leopard prototyp A2 Suspension. Then the 10,5 cm L7A1 Gun and the MTU MB 838 CaM 500 Engine in whichever order you prefer. Next, research the Porsche Standardpanzer Turret, as it increases DPM and gun stats. Finally, research the SEM 25 Radio. Although, something useful to note is that every module can be mounted without the tracks, as long as you research and mount the top gun first. Leopard Prototyp A tanks were produced in the period from 1960 through 1961 as a part of the competition for the new Bundeswehr tank, with a total of 26 prototypes manufactured by Porsche. Competing team, Rheinmetal with a cast turret version presented additional six units for testing but failed to win the contract. The prototypes were tested up to 1963. The vehicle was the predecessor of the Leopard medium tank. The Leopard project started in November 1956 in order to develop a modern tank, the Standard-Panzer, to replace the Bundeswehr's American-built M47 and M48 Patton tanks, which, though just delivered to West Germany's recently reconstituted army, were rapidly growing outdated. On 25 July 1957 the detailed specifications were released; the new design needed to weigh no more than thirty metric tons, have a power-to-weight ratio of thirty horsepower per ton, be able to withstand hits by 20 mm rapid-fire guns on every side as well as operate in a battlefield contaminated with chemical weapons or radioactive fallout, the then-standard baseline for combat with the Warsaw Pact. In addition the main armament had to consist of a 105 mm caliber weapon (the new British L7A3 105 mm gun was selected), carrying at least as many rounds as current US tank designs. Mobility was the priority while firepower came second; armour was seen as less essential, as it was believed no real protection against hollow charge weapons was possible anyway. France was very interested in the design as its own AMX 50 project had just failed. In June 1957, West Germany and the French Fourth Republic signed an agreement to develop a common tank, designated in German Europa-Panzer. Three German (Arbeitsgruppe A, B and C) and one French design team would be included in a competition, with each team producing two prototypes each. In September, 1958 Italy joined the development program. Several prototypes were entered for testing in 1960. Among the prototypes were Porsche's Model 734 from team A, sporting a cast turret and that of team B (Rheinmetall) whose cast turret was somewhat higher. Team C from Borgward, designing a very futuristic tank, failed to have a prototype ready in time.. Even before these first prototypes were finished, it had (in 1959) been decided that a second phase with improved designs would be started: Team A had to build 26 phase II Prototypes for testing, team B six. Only two tanks of the required six would actually be constructed by team B. The Porsche Prototype II was eventually selected as the winner of the contest in 1963; this did not come as a surprise: it had already been decided in 1961 to build a preseries of fifty vehicles based on this design; production of these was started that very year. This "0-series" was modified with a new cast turret and several hull changes to raise the rear deck to provide more room in the engine compartment, and move some of the radiators to the upper sides of the hull. Before mass production of the standard version started it was also decided to add an optical range-finding system for better long-range gunnery, which required the turret to be somewhat taller, and added "bumps" on either side of the turret to mount the optics for triangulation. 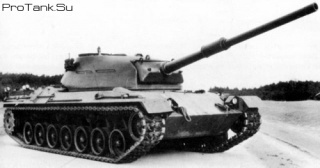 In 1963 France and Germany had decided to each build their own tank; Germany continued with the Leopard, while France built the similar AMX-30. Production was set up at Krauss-Maffei of Munich from early 1964 onward, with deliveries of the first batch between September, 1965 and July, 1966. The Leopard was soon being purchased from Germany by a number of NATO members and other allies including in chronological order Belgium (1968), the Netherlands (1969), Norway (1970), Italy (1971), Denmark (1976), Australia (1976), Canada (1978), Turkey (1980) and Greece (1981). Germany has a strict export policy for military equipment; Greece, Spain and Chile, while still dictatorships, purchased the French AMX-30. After the first batch was delivered the next three batches were the Leopard 1A1 model, which included a new gun stabilization system from Cadillac-Gage, allowing the tank to fire effectively on the move. The 1A1 also added the now-famous "skirts" along the sides to protect the upper tracks, and a new thermal jacket on the gun barrel to control heating. A less important change was to use rectangular rubber blocks fastened to the treads with a single pin instead of the earlier two-pin "shaped" versions. The rubber blocks could be easily replaced with metal X-shaped crampons for movement on ice and snow in the winter. Between 1974 and 1977 all of the machines in the first four batches were brought to the same Leopard 1A1A1 standard, and given additional turret armor developed by Blohm & Voss. A further upgrade in the 1980s added leftover image-intensifier night sights which were being handed down from the Leopard 2 as they were themselves upgraded. The PZB 200 image intensification system was mounted in a large box on the upper right of the gun, creating the Leopard 1A1A2. A further upgrade with SEM80/90 all-digital radios created the Leopard 1A1A3. The first 232 tanks of the fifth production batch was delivered as the Leopard 1A2 between 1972 and 1974. The A2 included a heavier and better armored turret, and therefore did not receive the B&V armor add-ons as did the earlier machines. They did receive the other upgrades however; the Leopard 1A2A1 received the PZB 200, the Leopard 1A2A2 received digital radios, and the Leopard 1A2A3 got both. The next 110 vehicles in the fifth batch were fitted with a new welded turret, which was equipped with a new armour consisting of two spaced steel plates with a plastic filling between them, and a wedge-shaped gun mantlet, creating the Leopard 1A3. Although the level of armor area density was equivalent to the A2's new welded version, the internal volume was increased by 1.2 m³ and the effective protection level was increased by half. The improved TRP 2A independent sight was installed for the commander. Upgrades were identical to the 1A2 models, the Leopard 1A3A1 with the night sights, Leopard 1A3A2 with the new radios, and the Leopard 1A3A3 with both. The Leopard 1A4 formed the sixth batch of 250 vehicles, delivery starting in 1974. The 1A4 was externally similar to the 1A3, but included a new computerized fire control system and the new EMES 12A1 sighting system to aim it. In addition the commander was provided with his own independent night sighting system, the PERI R12. The new equipment used up space and the ammunition load was reduced to 55 rounds, of which 42 were stored in the magazine to the left of the driver. In 1980 a research program was undertaken to study further improvements to the Leopard 1, providing it with a completely modern fire control system and fully effective night/bad-weather vision system. This was going to require even more room than the larger turret from the 1A3/1A4 models, so the decision was made to base the upgrades on the earlier models which were no longer competitive. The resulting Leopard 1A5 was based on 1225 vehicles of the Leopard 1A1A1 model. The turrets were again modified for the 1A5, with a larger section at the back, both in order to store all of the new equipment, as well as to move more of the ammunition into the rear turret, as opposed to the left side of the driver where it had traditionally been stored. The storage locker extended the turret almost to the rear of the tank when the gun was facing forward. The new turret was also able to mount the newer 120 mm gun from the Leopard 2 if desired, although this option has not been used. After trials the Krupp-Atlas Elektronik EMES 18 fire control system was selected in December 1983, developed from the EMES 15 used on the Leopard 2. The EMES 18 included two new sights on to the top of the turret, and no longer required the "bumps" as did the earlier optical systems. A crucial part of the upgrade was the introduction of more effective ammunition, including new APFSDS rounds. The Leopard tank could also be fitted with bolt-on lexan armour panels, which have increased the effectiveness of the armour. These "modified" tanks have proved themselves in the field. The first modified vehicle was delivered in early 1987. Since then almost all users of the Leopard 1 have also applied similar changes to their own vehicles, and in most ways the 1A5 can be considered the "standard" Leopard 1 today. A single 1A1A1 was also modified with additional armor on the turret and had the 120 mm gun as the Leopard 1A6. The project was ended in 1987, as the Leopard 2 was in widespread service at this point and the 1A5 offered a reasonable upgrade path for a fraction of the cost. This page was last modified on 18 July 2018, at 05:50. This page has been accessed 275,198 times.